Mike McCafferty’s group, The A.Y.U. Quartet, has recently released its new single entitled “Bald Man Blues.” I recently purchased and downloaded a copy for myself and I have to say it’s quite clever and funny. The group sounds as good as ever. Visit one of the sites below to preview and purchase a copy of this song for yourself for only 99 cents! This weekend I went to my first film festival. The California Independent Film Festival is a small festival held in nearby Livermore, and this year was its tenth year running. Time didn’t allow me to see everything, so I only attended a few events. The first event I went to was a seminar on Saturday on Directing, Producing and Distributing Indie Films. It was only 45 minutes long. What could they possibly share in only 45 minutes that I didn’t already know? The answer was…nothing. I’ve heard it all before. They mostly talked about distribution of indies. Nothing much about directing or producing. There simply wasn’t any time. The prevailing attitude that shorts are nothing more than a calling card was expressed and so I shared a story that I know of a short that actually did make money. I’ll have to blog about it sometime. It’s a great example of out-of-the-box thinking. The next seminar immediately followed and it was on Indie Music for Television and Film. Okay, I actually learned a few things at this seminar. Most notably, I learned about the importance and role of a music supervisor in a film. Besides finding the music for a film, a big and very important part of a music supervisor’s job is to get clearance on music rights. Without the proper clearance, lots of legal problems can crop up and that can cause all kinds of headaches that could have been avoided simply by doing due diligence. One of the panelists was a music supervisor with a long list of TV and film credits. He has the kind of experience I would be looking for to build a strong team for my film, so after the seminar I talked to him and got his contact info. I got an invitation to the filmmakers party that night, but the darn thing didn’t start till 10:00 p.m. I’m an early riser and I need my sleep, so I passed on the party. The next morning I was back at the theater to watch the Tri-Valley Shorts Showcase…a slate of nine short films from filmmakers here in the Valley. The reason I wanted to see this series was because I knew a couple of the filmmakers whose shorts were being featured. One of them was John Meredith. You long-time readers may remember that I blogged about his On The Lot entry last year. Well, John has come a long ways. This was the first time he got one of his shorts on the big screen and his filmmaking skills keep getting better with each film. Overall, this was a nice introduction to film festivals. One of these days I really need to attend one of the big ones like Sundance, Toronto, or Cannes. Oooh, visiting France sounds like fun. 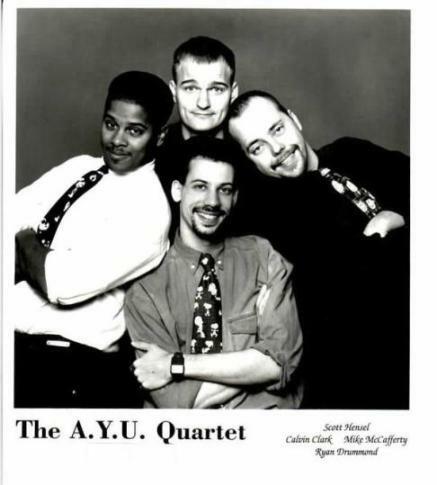 Back when Mike McCafferty was attending college at Eastern Michigan University, he and three of his college buddies formed an a cappella group called the A.Y.U. Quartet (Atomic Young Ultrasonics). Now, you have an opportunity to see Mike perform live with this group because, after 15 years, the A.Y.U. Quartet is having a reunion concert! They’re going back to Ypsilanti, Michigan, for a one-night-only performance to be held at the Sponberg Theater on the Easter Michigan University campus. The date is Saturday, September 22, 2007, at 7:00 p.m. Tickets can be bought at the door or through EMU Online Ticketing. Prices are $15 for general admission, $12 for students, $9 for Mainstage Members, and $6 for kids ages 5-12. You can check out how talented these guys are by listening to a small selection of their songs on the A.Y.U Quartet MySpace Page and also on the CD Baby site (where you can buy their CDs). Scroll down further on their MySpace page to watch a video of their various performances. The same video is also available for viewing in two different sizes on the Michigan Travel website. It’s lots of fun to watch and it includes some high praise from comedian/actor Soupy Sales.